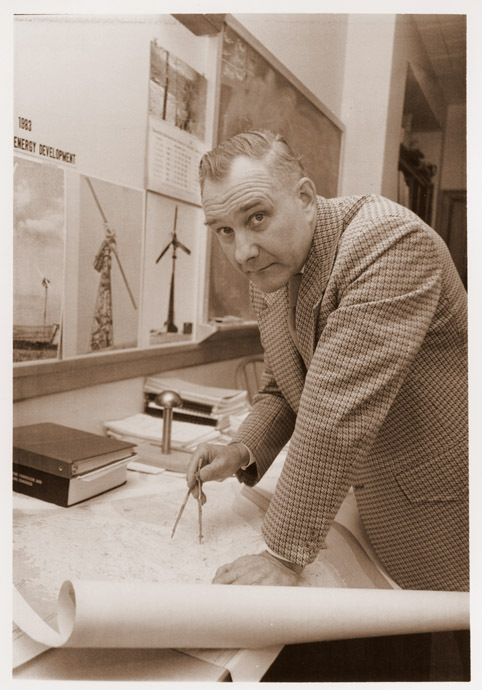 William E. Heronemus underwent a radical transformation during his tenure as Professor of Civil Engineering at the University. After serving in the U.S. Navy, engineering the construction of submarines from 1941 until his retirement in 1965, Heronemus disavowed his work with nuclear energy and joining the University faculty in 1967, dedicated his life to the study of alternative energy. Born in Madison, Wisconsin, Heronemus earned his B.S. from then United States Naval Academy and two M.S.s (Naval Architecture and Marine Engineering), from the Massachusetts Institute of Technology. Heronemus was invited to the University to help develop a research program in Ocean Engineering and focused his work on alternative energy to sources that could make use of oceanic power. William Heronemus retired from the University in 1978 and died of cancer on November 2, 2002. The William E. Heronemus Papers document his research in alternative energy and his quest for harnessing wind and thermal power from the ocean through technical reports on alternative energy systems written from 1972 to 1974.